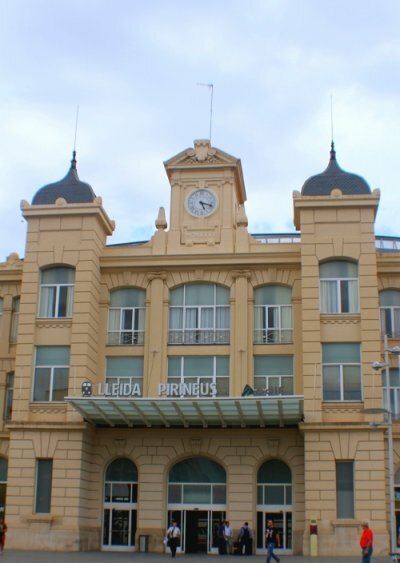 The train station for the AVE in Lleida is called Lleida Pirineus. It is a very important station and it was renovated in 2003. This station connects the interior of Spain with the Mediterranean Corridor. It also serves as a link on the route with the AVE Madrid - Barcelona. The name of the station could seem strange, Lleida Pirineus, because the city of Lleida is not in the Pyrenees but it is in the province of Lleida and there is a line that connects Lleida with the mountains. Since 1860, Lleida enjoys rail service and at the end of the 19th century Lleida was knotted with Zaragoza, Barcelona and Tarragona thanks to the train. A station was built in the French style and the station was called Estación de Lleida or Estació de Lleida but after the works and remodelling with the arrival of the AVE in 2003, the name was changed to Lleida Pirineus. One of the most notable changes after the works were the steel structures and glass installed to cover the bad weather in the station.